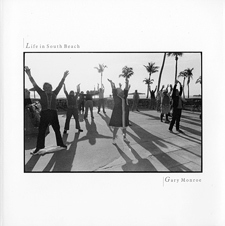 LSA is the sole distributer of Gary Monroe's books. The non-profit small press Forest+Trees, which published the books, limited each title to 1,000 copies; fewer than a quarter of this amount are now available. Signed copies on request. While living among the elderly Jews of Miami Beach from 1977 through 1986, the photographer recorded aspects of their communal lives and vanishing culture. Their lifestyle–an embodiment of old world traditions–manifests values and mores based on spiritual camaraderie and social isolation. Eighteen photographs have been selected (18 means “life” in Hebrew) which reverberate with the energy of these survivors. 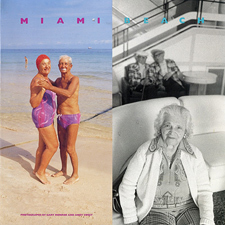 The black and white photographs describe the patterns of community that was unique to the Jews of South Beach. As a document, this book is a precious legacy that lives on in spite of the neighborhood’s phenomenal make-over as the world’s premier art deco district. Copyright 1989. Forest + trees. 52 pages with 18 plates; oral history excerpts. Edition of 1,000 of which 125 are cloth bound. Miami Beach lyrically depicts the old world Jewish culture of South Beach. Having been referred to as “the last resort,” the once-glamourous area became as refuge for elderly Jews of eastern European derivation. It was a bastion where these people, typically non professionals from New York, found solace and camaraderie during their later years. During the decade that the photographers–both "natives"–worked there, the presence and unique lifestyle of the elderly Jews waned. Attrition took its toll. But social shifts were more relentless; by 1990 dilapidated hotels had become posh resorts as a youth oriented, economic tidal wave swept through South Beach. Copyright 1991. Forest + Trees. 96 pages with 46 plates–color and b+w; foreword by Isaac Bashivas Singer. Edition of 1,000 with fold-in covers. Most of the photographs in this book were made during the photographer's first few of 16 years of travels through Haiti, between 1984 and 1987, when the country was in the last throughs of the Duvalier regime and its foray into democratic rule–before Haiti changed. 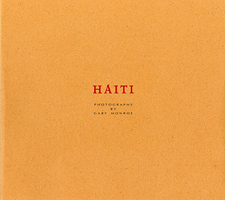 The photographer's work on Haiti was supported in part by two Fulbright fellowships. Copyright 1992. Forest + trees. 56 pages with 22 plates.